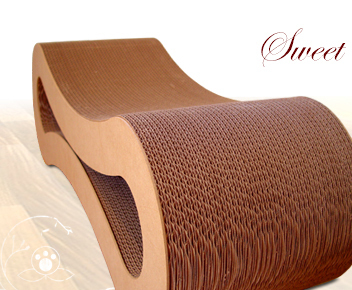 -Ergonomic curves scaled especially for cats. -Generous radius provides an extra large, elevated napping area. -Symmetrical design allows for reversibility. -A long-term solution to scratching problems. -Recycled cardboard, 35-percent-minimum post-consumer, hardboard end-panels, 100% recyclable. -Highest quality & durable materials. -Made locally in Pacific Northwest, USA.